Pioneers in the industry, we offer aluminum bowl stand, aluminum desert stand, casted aluminum cake stand, enamelled cake stand, round footed cake stand and square footed cake stand from India. We are involved in the manufacturing and exporting of a high quality Aluminum Bowl Stand. Resistant to corrosion, it is widely considered among our customers. Known for its fine finish and durability, the range of aluminum bowl stands offered by us has fetched words of intense praise in the market. Subjected to quality checks on various parameters, it is assured of a premium quality. Our organization is engaged in offering superior quality Aluminum Desert Stand to our prestigious customers. This holder is manufactured from finest quality aluminum, which is obtained from the well-known vendor. The offered holder can be used in home, office, or religious places for the purpose of holding a candle. Moreover, the offered holder is commonly used for various decorating purposes by our customers. 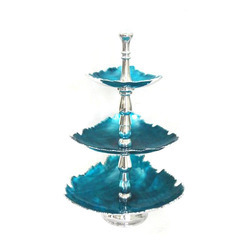 We are the renowned manufacturer and exporter of Casted Aluminum Cake Stand that is highly durable in its characteristics. Resistant to corrosion, it is widely acknowledged among our respected patrons. 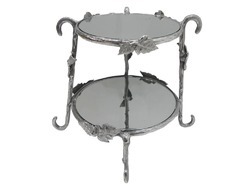 Easy to carry and maintain, this offered cake stand is highly demanded in the market. 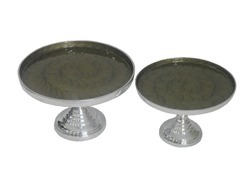 Furthermore, we assure the premium quality of the entire range of the aluminum cake stands offered by us. 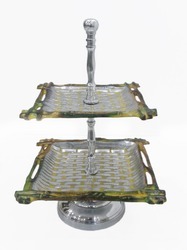 We are offering Enamelled Cake Stand to our clients. Owing to our vast experience in this domain, we have been able to offer world-class Round Footed Cake Stand to our clients' end. 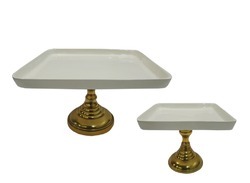 We are leading manufacturer and exporter of superior quality Square Footed Cake Stand. 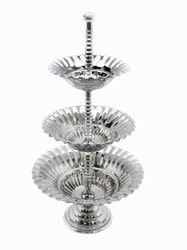 We are a trusted name to offer supreme quality Three Tier Cake Stand that is manufactured using high-grade aluminum, which is sourced from the credible vendors. Dimensionally stable, it is widely considered among our valued patrons. 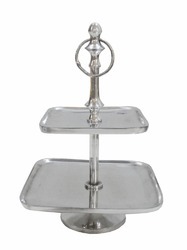 Owing to its fine finish and long lasting life, this offered cake stand is highly acclaimed in the market. This offered stand is further assured of a premium quality. Owing to our vast experience in this domain, we have been able to offer world-class Two Tier Cake Stand to our clients' end. 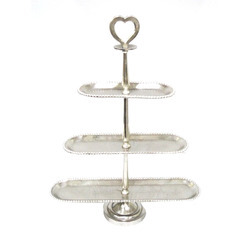 Looking for “Aluminium Cake Stand”?